A road trip over the Cascades through Snoqualmie Pass leads not only to a bucolic, big-sky Washington State and some of the most wonderful fruit stands (apples especially! ), but also to memorable restaurants. First stop, before heading upwards, is Twede’s Cafe, made famous in the TV Show “Twin Peaks” for its cherry pie. Beyond the Stampede Pass, the town of Cle Elum (meaning swift water in Kittitas) is home to out-of-this-world maple bars and donuts at the Cle Elum Bakery and Seattle-class coffee at Pioneer Coffee Company. Offered here is something called the “White Lightning Espresso.” This is an espresso made from beans that aren’t fully roasted, which gives the beans a pale almond color and causes the espresso to have triple the caffeine. In Ellensburg, the adorable Yellow Church Cafe serves artisan meals with outstanding layer cakes for dessert. This cafe operates out of a church that was built around the 1920’s. 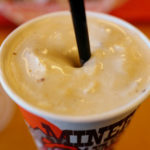 In Yakima, Miner’s Drive-In is a vintage joint, first opened in 1948, with huge burgers, good fries, and glorious ultra-thick milk shakes. Its cherry pie, as seen in the TV show "Twin Peaks," is the headliner, but Twede's is a northwest restaurant serving breakfast, lunch, and supper. Cake donuts and maple bars are at their best in this long-standing town bakery, which also is known for its cookies and bread. Good coffee, too. In a Pacific Northwest of excellent coffee, Cle Elum's Pioneer Coffee ranks among the best. Syrupy sledgehammer espresso is as good as it gets. Expertly crafted artisan fare, including house-baked breads and world-class cakes, make meals in Ellensburg's adorable former church restaurant truly heavenly. Oversize hamburgers, thick shakes, and French fries lead the menu at Yakima, Washington's popular Miner's Drive-In.